Polyethylene terephthalate (PET) is one of the most commonly used food grade packaging polymer due to its chemical inertness and appealing physical properties. Its properties as a lightweight, tough material with excellent optical properties and adequate gas barrier performance makes it attractive for various applications such as mineral water, soda drinks, APET sheets, pharma applications etc. Bottled water is the fastest growing beverage industry in the world according to the international bottled water association (IBWA), sales of bottled water have increased by 500 percent over the last decade. 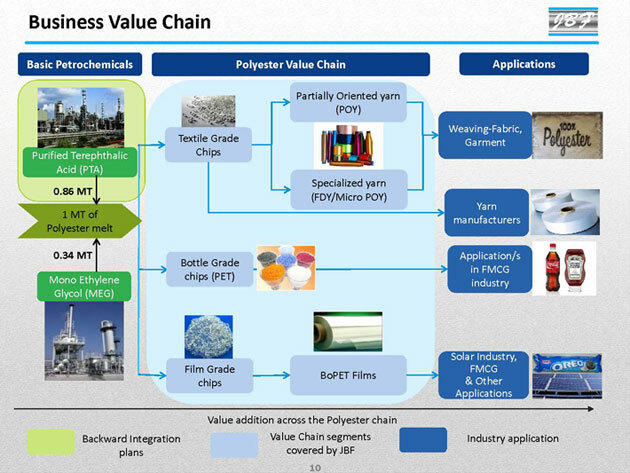 JBF Industries Ltd. is today's largest supplier of Polyester Chips in Indian domestic market with a dominant presence in textile grade chips and film grade bright chips. JBF is the third largest Partially Oriented Yarn (POY) producer in India and is recognized for its quality, commitment and service.